What motor transmission and suspension options you looking for? Rodger did you try sending him a message on the messenger of Big Mack Trucks? Hey Vlad thanks for sharing your knowledge. Did they change the motor itself too or will they still bolt in and wire up the same? Hey thanks I did see that one. I’m kinda looking for something with with engine trouble or something since I have a Superliner with a good V8 but no title. Even something sitting for awhile already would be alright with me. Really keeping a eye out for superliners there! He had it posted for a thousand but when I called him it wasn’t his asking price. Apparently just wanted to get ppls attention. I got some of the tires to air up and put some used ones on I had laying around yet. Yes anything to make it legal is taken off the truck, but Everything it needs to drive is there . You could come test drive it today. This is for sale again. 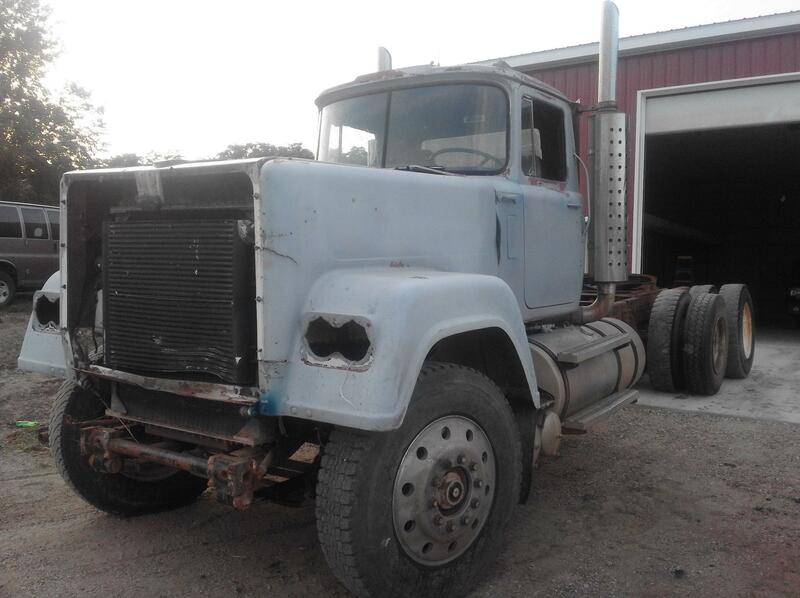 I have for-sale a 1983 Mack Superliner rws721lst with a EM9-500, T2090 transmission and air ride rear end. It runs good and does drive but needs tires. Interior is decent exterior is primed but somebody lost interest and never painted it. I do not have a title only a bill of sale. It is for parts. Asking $9500 obo. http://showroom.auction123.com/vehicle_selling_solutions/inventory/11537/1985/Mack/1M2V230Y4FN001446.html?leadsource=Showroom|vehicle_selling_solutions&amp;utm_source=usedequipmentguide.com Just happened to run across this a few days ago. Thought it might interest somebody.. The radiator is fine; its the Air to Air inter-cooler that you see damaged. Not sure what happened to it but it happened when the condenser was off because that is in good condition. It has the head lights, grill, condensor, and mirrors. No visor or bumper. Here is one picture that I had on my phone. It'll be a monday before i can get pictures but the truck was somebody's project truck and is striped down and primer ed gray. I bought it from a estate of someone who passed away. According to the grandson the title was lost in the whole process. I have no idea what the truck is worth, but would be open to offers. I believe it is a 240 in wheel base but will measure for sure when i get the pictures. I have a 1983 Mack RWS721LST with a Em9 440 rebuilt to 500 hp. It is a solid running truck, shift good drives good just needs body work. It does not have a title only a bill of sale.